Canadian murdered in Laos airport?? Thread: Canadian murdered in Laos airport?? "appears to be a restaurant inside the airport" - surprised no one saw anything??? Unless it is a cover up. Weird story. 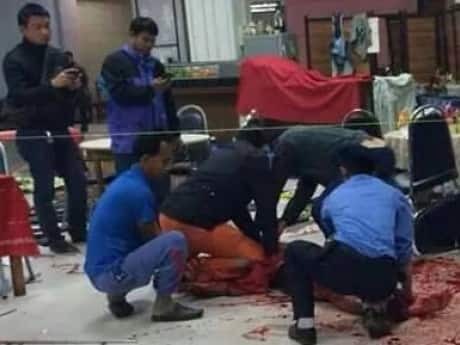 Laos police found four knives at the scene, which appears to be a restaurant inside the airport, with square tables covered with red tablecloths, surrounded by wooden chairs. On the floor, pools of blood and splatters surround the body. Warning: This is a graphic crime scene image. Not happy with the answers coming from the police in Laos, Pech's family started digging, by first arranging for a private autopsy. That autopsy, done by a pathologist at the Ramathibodi Hospital in Bangkok, Thailand, revealed Pech was stabbed repeatedly in the chest, had multiple wounds to his neck, including the jugular, and had what appeared to be numerous defensive wounds to his arms and hands.